OUR GOD IS AN AWESOME GOD - That is a theme that could be taken from this Sunday's readings. In both our first reading and Gospel reading, we hear of the awesome, radiant power of God that struck fear and awe in those whom God chose to witness it. Our Gospel reading (Luke 9:28-36) is the awesome story of the Transfiguration. Jesus led his chosen three disciples up the mountain and was transfigured before their eyes as he revealed his glory. They "became frightened" at the sight but then wanted to build tents and savor the moment. There is rich symbolism in this experience, as Moses and Elijah represented the Law and the Prophets of Israel. Jesus is God of all and God of all time..
"Jesus took Peter, John, and James and went up the mountain to pray. While he was praying his face changed in appearance and his clothing became dazzling white. And behold, two men were conversing with him, Moses and Elijah, who appeared in glory and spoke of his exodus that he was going to accomplish in Jerusalem. Peter and his companions had been overcome by sleep, but becoming fully awake, they saw his glory and the two men standing with him. "As they were about to part from him, Peter said to Jesus, 'Master, it is good that we are here; let us make three tents, one for you, one for Moses, and one for Elijah.' But he did not know what he was saying. While he was still speaking, a cloud came and cast a shadow over them, and they became frightened when they entered the cloud. Then from the cloud came a voice that said, 'This is my chosen Son; listen to him.' After the voice had spoken, Jesus was found alone. They fell silent and did not at that time tell anyone what they had seen." 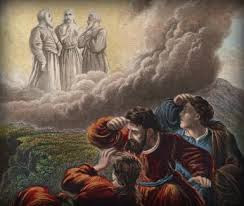 In our first reading (Genesis 15:5-12, 17-18), we hear of Abram's (Abraham before his name was changed) encounter with God as God promised him numerous descendants and also gave him the promised land. At Abram's questioning, God and Abram enter into a covenant (a sacred promise) using an ancient ritual of the time to establish an unbreakable bond. Much like the disciples in our Gospel reading, Abram was enveloped in a "deep, terrifying darkness". "The Lord God took Abram outside and said, 'Look up at the sky and count the stars, if you can. Just so,' he added, 'shall your descendants be.' Abram put his faith in the LORD, who credited it to him as an act of righteousness. He then said to him, 'I am the LORD who brought you from Ur of the Chaldeans to give you this land as a possession.' 'O Lord GOD,' he asked, 'how am I to know that I shall possess it?' He answered him, 'Bring me a three-year-old heifer, a three-year-old she-goat, a three-year-old ram, a turtledove, and a young pigeon.' Abram brought him all these, split them in two, and placed each half opposite the other; but the birds he did not cut up. Birds of prey swooped down on the carcasses, but Abram stayed with them. "As the sun was about to set, a trance fell upon Abram, and a deep, terrifying darkness enveloped him. When the sun had set and it was dark, there appeared a smoking fire pot and a flaming torch, which passed between those pieces. It was on that occasion that the LORD made a covenant with Abram, saying: 'To your descendants I give this land, from the Wadi of Egypt to the Great River, the Euphrates.'" In our Epistle reading (Philippians 3:17 - 4:1), Saint Paul writes how Jesus will change our bodies to conform with his "glorified body". "Our citizenship is in heaven, and from it we also await a savior, the Lord Jesus Christ. He will change our lowly body to conform with his glorified body by the power that enables him also to bring all things into subjection to himself. Therefore, my brothers and sisters, whom I love and long for, my joy and crown, in this way stand firm in the Lord, beloved." Fear and trembling, darkness and clouds were often used in the Bible to represent the Awe and Wonder one would experience in an encounter with God. Many of us have had some type of direct encounter with God that has left us filled with Awe and Wonder. We may savor the moment, but then we must go about living our daily lives, but differently. As in the song mentioned above, Our God is an Awesome God.